View cart “Decal – Turtle” has been added to your cart. Enjoy your morning gohwh (coffee) or evening dh (tea) with this beautiful vibrant color mug. 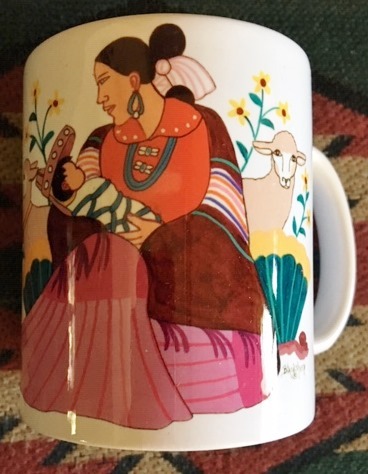 This Native American design coffee mug by Beverly Blacksheep, Navajo, features a creative drawing of a Navajo woman dressed in her traditional outfit, holding her baby in a cradle board. She is surrounded by sheep and flowers.